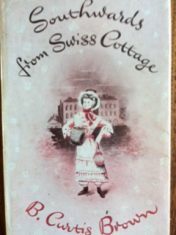 You are here: Home>New contributions>Childhood in St John's Wood - extracts from "Southwards from Swiss Cottage"
“We lived in a large square early-Victorian house in St John’s Wood, joined , like a Siamese twin, to another identical with it. Our house was part of a crescent, called St John’s Wood Park. Every house was built about the same period, between 1830 and 1860, I would say, and most of them were stucco-fronted and painted in white or pale colours. They were set back from the road with a garden in front and behind. Lilacs were abundant in the gardens, and many gardens had pear trees, left over from the days when orchards had flowered down Finchley Road. Many musicians lived about the Park. An opera singer used to practice his exercises in the house across the street, and an old Jewish gentleman, who lived behind us, played the ‘cello every Sunday morning. In springtime you could walk in St John’s Wood, however young you might be, with glory bursting inside you. We had many singing birds there; and though the authorities used to pollard the limes so severely that they left only clubbed and lopped trunks, still these would put forth blossoms, and the spring sunlight would shine through luminous , delicately- toothed leaves, that shook above your head , while rose-pink shell-like bracts came floating down to scatter over the pavement. ……..No trees can draw in and breathe out such sweetnesss from the air as the limes in those quiet roads: Acacia Road, Norfolk Road, Avenue Road, Woronzow Road, Marlborough, Blenheim. …..
Eton and Harrow at ‘Lord’s’ was the high spot of the summer. My elder brother was at Harrow and I was allowed to go to one half-day of the match. My brother would, of course, be dressed in top hat and tails, my father likewise, , my mother in her most frivolous and smartest frock, with a hat that was a knockout …..